Could you just varify for me that on you web site, for water, the 2nd criterium is correct? Yes there was a mistake included in that criterium (and inside the 2nd criterium for the fire hand as well: 'finger length' is now replaced for palm breadth). But these errors have now been corrected. Martijn I am not getting that at all. How could palm breadth for fire fall inbetween .75 and .80? "2) Fire criterium 2: 0.75 < (palm breadth versus palm length ratio) < 0.80 "
So, this criterium relates to the ratio: pb/pl ... and not just 'palm breadth' (= pb)! PS. Your questions are welcome. Do not hestitate to ask question, because it might help me to improve the presentation of these guidelines! By the way, I have just also checked your first measurements: these would also result in AIR/FIRE hand shape! Still not getting it. 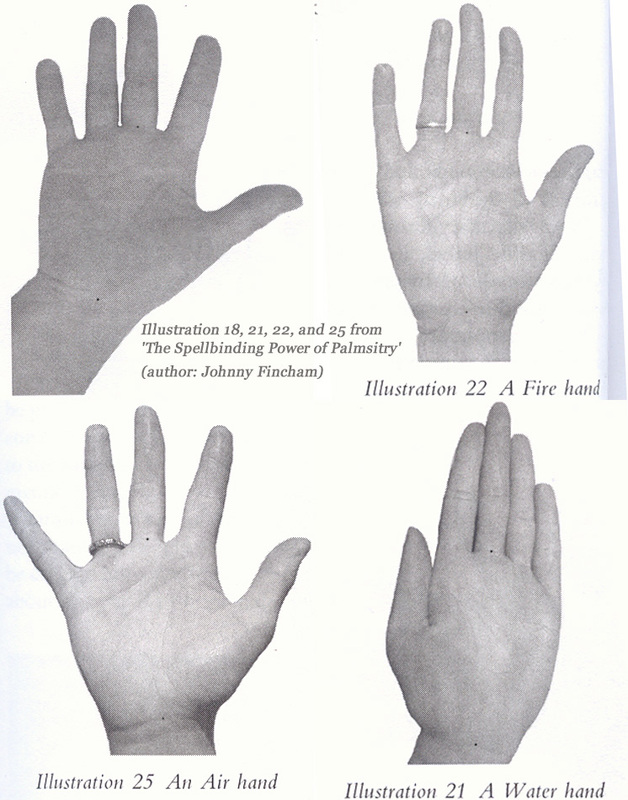 It looked like the 2nd criterion for all the hands shapes was basically determining whether or not the finger to palm length ratio fell into the standards set for each handshape. Sorry Tap... I have to report now that there is still something not correct in the criteria that I have presented right now. I need some more time... it appears that the moderation that I just made was not correct. PS. This probably implicates that every hand shape has 3 requirements (like is described by my picture), and not just 2 (which I suggested with the formula). Problem solved, but now I have to upload the 3th criteria... which takes little time. But I also have describe new guidelines for how to make an evaluation - this takes more time again. It might be the formulas for criterion 1, may need to be looked at. No, criterium works just fine. By the way, I have uploaded now the new criteria - which implicates that you can try to assess you hands for each of the three criteria. Tap, you will find then for your hands that your right hand meets 2x the requirement for FIRE hand shape + 1x the requirement for EARTH hand shape. This results in the classification FIRE hand shape for your right hand (because if 2 or 3 requirements are met for a specific hand shape... that specific hand shape represents the shape of your hand). This is also confirmed by the fact that the 'finger coordinates' for your right hand are inside the red zone...! By the way, this also implicates that you do not have a 'pure' FIRE hand shape - because that would require you to meet all 3 requirements. Well, the guidelines now work for identifying hands that can be described with one hand shape only.... however, the guidelines do not work for hands that meet requirements that relate to 3 different hand shapes (I am talking about 'mixed' hands). Unfortunately, for those hands it is probably really required to consider my guidelines in the picture for finding the 'shape profile', and then it also requires to use the full profile... instead of just counting the elements! Now that I have recognzied that this is the situation, I might better present the criteria in another format - just to make it more easy to find the 'shape' formula. I've only got as far as the first criteria for fire. You're working hard on this! I'm not sure how you can have a hand that relates to 3 different hand shapes? Two elements in handshape is enough for purposes of classification & doing readings. If it came into Johnny's 'undifferentiated' category, then there is nothing to say about it in readings. I know your focus isn't on doing readings. Just wondering if you are making it too complicated. Lynn wrote: I've only got as far as the first criteria for fire. Sorry, there were quite a few typo-mistakes in the earlier version(s) that I presented today. By the way, that requirement (fl > pb) did not follow the requirements in my picture.... because that would not make sense at all. After finding the SHAPE CODE for a hand you can compare it with the typical FIRE SHAPE CODE: + | ++ | - "
When you look at the details, you can that you have 1 match with AIR (first aspect), one match with EARTH (second aspect), and one match with FIRE (third aspect). However... because your profile has 2 contradictions with EARTH as well, therefore the EARTH-match can be ignored because your shape profile has far too many '-' signs to be associated with EARTH hand shape. This leaves only the option of a FIRE/AIR hand shape combination for both of your hand! I am quite good at maths, but it still seems too complicated! Lynn wrote: I am quite good at maths, but it still seems too complicated! Lynn, if you look in the picture you'll see that you 'finger coordinates' are indeed positioned closest to the red zone - which shows that the FIRE aspect in your mix is dominant. (EDIT: I described my method regarding the percentages earlier in this discussion as a point counting system - but these are not featured in my article. And since I doubt whether percentages could become useful for any practical purpose, I haven't planned to share those in my article). PPS. The maths are not complex, but I agree that I better withdraw my idea that this method is like 'child's play' (I was too optimist about that yesterday, after I thought that it should be possible to described each hand with just 2 requirements). Yes Lynn, I understand what you are saying here. And my method indicates that fire is dominant for your 'mixed' hand shape. ... then we can see that it takes only 2 steps (and the correction of just one contradiction) to get the FIRE SHAPE PROFILE; however, it takes 3 steps to get the AIR SHAPE PROFILE (including the correction of 2 contradictions). However, I would say that according the C.S. principles your hand can not be described as a FIRE hand shape. Because your fingers are not short at all, and your palm shape is slightly more wide than long - afterall Lynn... how can we describe your palm as 'long' in the perspective of the fact that you have the long fingers??? However, my approach indicates that if the 3 dimensions (fl, pb and pl) are considered together in your hands, the combination leaves no other option than that your hands most resemble a FIRE hand shape (despite that your fingers are slightly long and your palm is slightly short - because of the long fingers). thanks for your explanation Martijn. I will study your method in more detail when I get time. ... I have just added another picture to my article which visually describes the essential differences among the 'SHAPE PROFILES' of the 4 hand types. So, FIRE is indeed by far the most dominant element for your hands. But one can for sure not speak of a 'pure' fire hand... because of the percentage below 50% + the small contradiction regarding the typical FIRE profile and your slightly wide palm breadth. But since the percentages for AIR is much lower, and WATER is not high either (and WATER has not match at all), one could argue that your hand can still best be described as a FIRE hand shape. But one could also argue for 'mixed hand shape' dominated by FIRE. NOTICE: These profiles fit with the details that I have presented in my picture that presents the refined definition for the 4 hand shapes + the elemental axes (see the picture below). Then it will become quite easy to find out which of the 4 elemental hand shapes is most dominant in the hand - even when the hand can best be described as a 'mixed' hand shape! Martijn, sorry I am still far behind in this discussion. Thank you for keeping us informed at every stage of your thought processes, it is fascinating to see how you've formulated all this. (and thanks for using my hand as an example which makes it easier for me to follow your thoughts!). Even tho there are parts I don't understand, or even parts I disagree with, I thank you for putting all this time and effort into understanding elemental handshapes and trying to find a formula. If it works, it will be an amazing piece of study & research. (even if it is difficult to put into practise in readings). PS (edit) - I am happy to help you go through Johnny's photos if it helps to focus your thoughts. Can you explain with a few arguments/details to my why you consider your palm as 'more fire than air'? PPS (edit) - I am happy to help you go through Johnny's photos if it helps to focus your thoughts. Great, then I will scan the pictures from his book for us to work with. OK it's a good question. I think there is some historical reason for this, going back to the seminar I went to about handshape. When I look at my hand dimensions written down around 1996, I have palm length 10cm, palm width (measuring across centre of palm, half way up) 8cm. earth finger 8cm. ie classic fire shape palm, with 'medium' fingers. (I only have one set of measurements, probably right hand). This translates as standard fire shape palm with slightly longer fingers than fire shape hand (which adds a little air). I realise that recently I have given you different measurements, ie palm being 1 - 2 mm longer and width being 2 - 3 mm shorter (measured across metacarpals instead of centre of palm). On a personal & holistic level (taking other areas of the hand into account) I am open to your idea about it being a matter of perception, because the air element is the one I most lack confidence in. (but over-all fire is my weakest element!). Please explain - because your fingers are slightly long, this implicates that your palm must be slightly short. If my fingers are slightly long in relation to length of palm, how can this imply that my palm length is short? and Fire/Water in the definition of long palm, long fingers - only it's too wide for water. Lynn, I think this is only the logical consequence of how 'finger length' is defined in the C.S. system. Because I observe that according the books and according your perception, in the C.S. 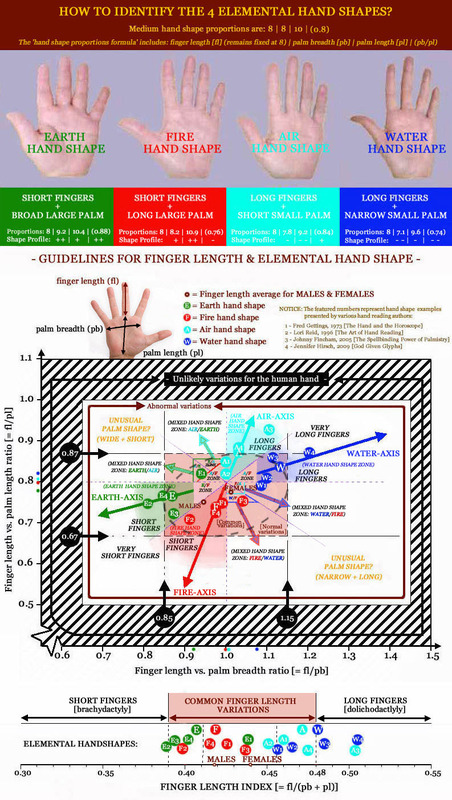 system finger length is always assessed in the perspective of 'palm length' only. So, if fingers are short... according the guidelines that can only be the result of the length of the palm - which should be long (in the perspective of finger length). And if fingers are long, according the guidelines in your system it appears to me that this can only be the result of the palm being short (relative to finger length again). I could say that it appear to me that in the C.S. approach you have been guided to use relative measures only. Thanks for describing the history of how you developed your perception. But for me it is a bit funny how you have used only two aspects of your point of reference regarding the typical fire hand PROPORTIONS (which you described earlier this week to be: 7.5 - 8 - 10). Because, I would assume here that a typical fire palm does not display the same dimensions of a medium palm. For, if that had been the case then a fire palm could also have been described as: just a normal palm (featured with short fingers). However, the fire palm is described as an oblong palm (Fincham) / large rectangle palm (Dukes)... and for me this makes sense. But the logical consequence for me that one can not use the typical fire palm proportions... without considering those in the perspective of finger length. However, I do realize that... IF you have been told that a medium hand can be described as having the typical PROPORTIONS 8 - 8 -10, then I would understand why you assumed that you have typical fire palm dimensions. But if nobody has described any typical PROPOTIONS for a medium palm... then I can inform you that according my sense for logics regarding the C.S. guidelines (I hope you allow my to make such a point) + the results of my study... I would point out that your hands do not show the typically large palm-ratios that are seen in the proportional guidelines for a fire hand shape. Because in the sequence 7.5 - 8 - 10... the last two numbers have a much higher ratios (in respective: +6.6% and + 33%) compared to the finger length. Because in both of your hands those ratios are completely different (-2.5% and + 28%). PS. In this perspective I think it is interesting to hear you saying that you consider fire as overall your 'weakest element'. But that could substantiate my perception regarding the option... that the dimensions of your hand (with metacarpal palm breadth) indicate that your hand shape can very well be described as a 'mix'... with fire representing the dominant element (in a mix with air). And I think this is actually supported by the principle that your relatively long fingers give a touch of 'air'... however, in the perspective of your palm breadth only! Because in the perspective of your palm length your fingers are by far not long enough to be associated with air, nor with water. Anyway Lynn, thank you for sharing this + thank you for answering my question! Sorry, only Earth and Water can not make a combination in reality (not Fire/Water). And regarding the percentages, these do not take into account whether there are any matches between Lynn's hand and the typical proportions of the elemental hand shapes. "Martijn, I didn't say I have fire/air hands"
Regarding the 75%, I think we should try to understand this in the spective of a typical 'medium' hand shape... which does not show any typical combinations, and therefore scores no points for any of the 4 dimensions (only negative points). So, the closer the hand proportions resemble the medium hand shape (in my perspective it has the 'magical numbers': 8 | 8 | 10 | 0.8 - see my picture),... the lower the total percentage will get (this is because I do not translate 'negative points' into a percentage, etc.). PS. So, the percentages are just kind of an experiment at this stage. Basically, I am being confronted with a problem regarding some of the ink prints - however, since are not sure about those dimensions... it's kind of hard for me to judge the implications. This is one of the reasons why I would like to continue the discussion via Johnny's hand examples.